Illegal logging is a very important problem to be solved for the world wide preservation of environment and sustainable forest management. The Japanese government has been tackling this problem based upon the principle that 'illegally harvested timber should not be used'. Cooperation at bilateral, regional and multilateral phase, developing technology for distinguishing illegally harvested timber, supporting measures in private sector and so forth have been carried out as countermeasures against illegal logging. Besides, G8 Gleneagles Summit held in UK July 2005 endorsed the outcome of the G8 Environment and Development Ministerial Conference which committed to a range of actions to adopt public procurement policy, to control illegal logging and associated trade, and to assist timber producing countries. And in "JAPAN'S CLIMATE INITIATIVE", it is also referred to that actions should be taken to tackle illegal logging through government procurement policy and other related policies. 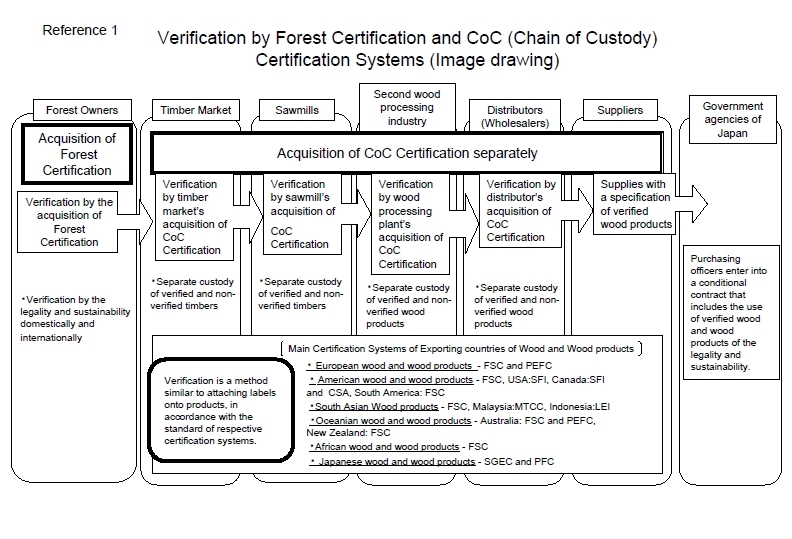 Under these circumstances, Government of Japan set methods for verifying legality and sustainability of wood and wood products and decided to promote verified products as appropriate items for procurement of ministries and agencies, independent administrative institutions, special legal entities and so forth, by means of amending "Basic Policy on Promoting Green Purchasing" of "Law Concerning the Promotion of Procurement of Eco-Friendly Goods and Services by the State and Other Entities" (Law No.100 of 2000). This guideline is drawn up to indicate some points which the supplier of wood and wood products should pay proper attention to when they verify legality and sustainability of their supply. The definition of each terms in this guideline are as follows. The timber to be procured should be harvested in legal manner consistent with procedures in the forest laws of timber producing countries and areas. The timber to be procured should be harvested from the forest under sustainable management. 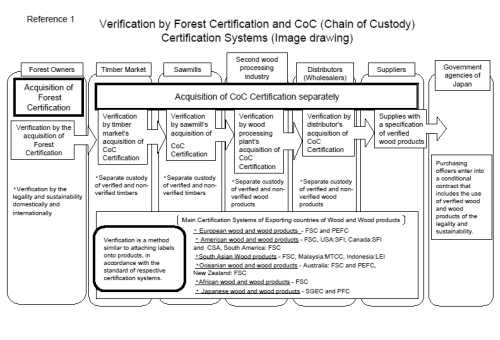 System in which third party institution assesses and certificates the forest management level based on the standard settled by the independent forest certification institution. System in which third party institution assesses and certificates the company about its way of custody to separate wood and wood products which originated in forest with certification properly from those not. The way of custody to manage wood and wood products verified with legality and sustainability separated from those not. 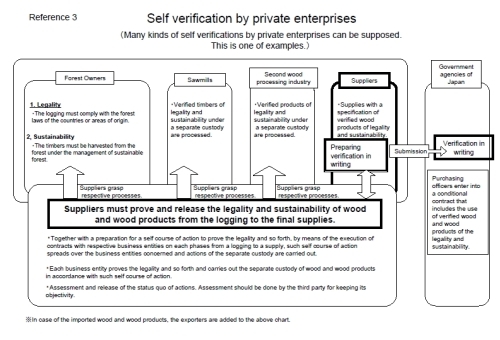 Examples of methods of verification on legality and sustainability of wood and wood products are as follows. 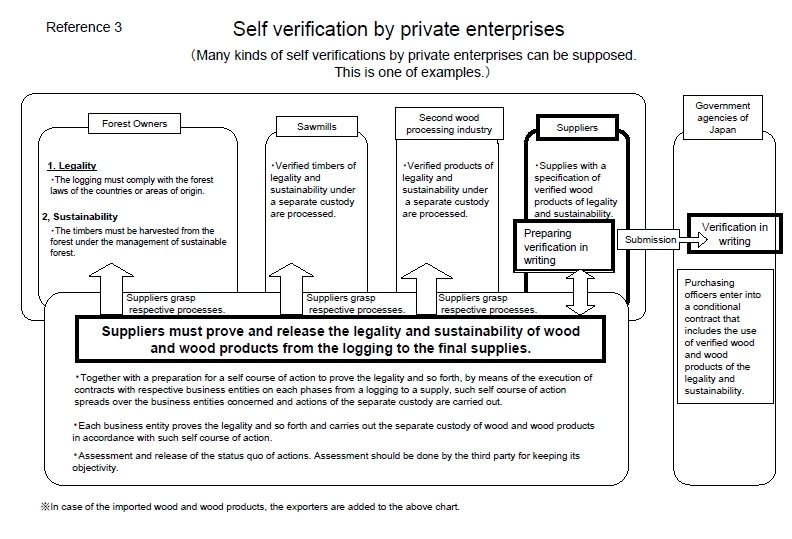 Legality and sustainability need to be verified by the certification seal on wood and wood products, payment or receiving slips and so forth connecting with CoC certification. Associations for forest owners, forestry or wood industry make their voluntary code of conduct for supplying wood and wood products verified with legality and sustainability. Under these voluntary code of conduct, the scheme to guarantee the association member's adequate way of supplying wood and wood products verified with legality and sustainability (for example, scheme to assess and guarantee the system for separate management, document management, etc.) and points to be paid proper attention when supplying wood and wood products and other articles should be prescribed and announced publicly. 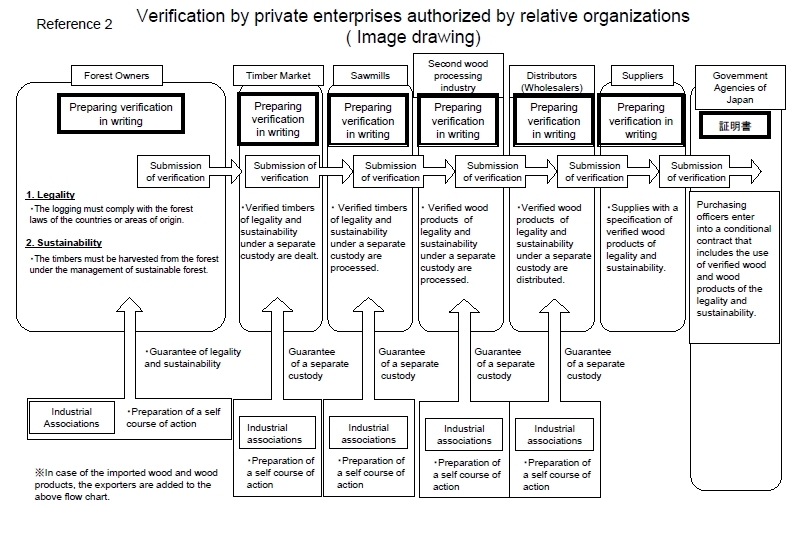 In the verification at each stage on legality and sustainability, the given number when verified should be described in addition to the basic information about list of items amount and so forth of objective wood and wood products. At harvesting stage, in addition to the basic subjects in general notes (a. above), the name of site where the timber was harvested should be described and legality and sustainability should be verified as indicated below. i) Regarding legality, it should be described in the verification that the timber was harvested in legal manner consistent with procedures in the forest laws of timber producing countries and areas. ii) Regarding sustainability, it should be described in the verification that the timber was harvested from the forest under sustainable management. 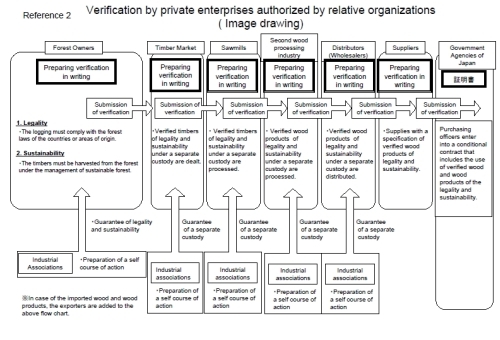 At processing and distributing stage, in addition to the basic subjects in general notes (a. above), it should be described in the verification that the products are verified with legality and sustainability or made from materials verified. At delivery stage, on requests from purchaser, in addition to the basic subjects in general notes (a. above), it should be described in the verification that wood and wood products for delivery are verified with legality and sustainability. i) Verification of legality and sustainability needs the description of necessary subjects, but statement of delivery with necessary description of these subjects could be substituted for the verification. ii) Part of description of subjects in the verification could be omitted if the copy of existing documents (such as statement of delivery) with the same contents as verification are attached. A company such as a large scale one, not adopting the method (1) or (2) above, verify legality and sustainability by means of its original measure under comprehension of distribution process from harvesting to delivery. Regarding legality and sustainability, the same level of reliability needs to be secured as the verification method by the company under the authorization of association for forest owners, forestry or wood industry. Related company should preserve verification they issued during definite terms and present underlying documents if required. This guideline will be assessed and reviewed by the multi-stakeholder meeting composed of diverse members such as related associations for forest owners, forestry or wood industry, persons from academic society and environment NGO with examination about the enforcement situation among the persons and companies concerned in wood and wood products sector corresponding to the government procurement based on the "Basic Policy on Promoting Green Purchasing", and proper amendment may be added as occasion demands.